Ireland�s Caroline Ryan had a superb showing today in the world track championships in Melbourne, taking a bronze medal in the women�s points race. It was the first UCI Elite track worlds medal for Ireland in 115 years. The former multiple Irish rowing champion finished third out of the eighteen rider field, behind Russian rider Anastasia Chulkova and Jasmin Glaesser of Canada in the 25 kilometre, 100 lap race. Chulkova created an important move when she went clear just over the halfway point. She was joined by Glaesser and Ryan, as well as Hong Kong�s Wong Wan Yiu. The four riders gained a lap just after the sixth sprint and each gained twenty points. Ryan was also third in two sprints during the race, ending with a total of 24 points. The performance confirms the talent of the Bus Eireann/Cunga sponsored rider, who turned to cycling after missing out on the rowing events in the Beijing Olympics, and took silver as a tandem pilot at the paracycling World Cup in Manchester in May 2009. She went on to take silver in that year�s paracycling worlds, then began racing as a solo competitor at Elite level. She was fourth in her first individual pursuit at the Cali World Cup in 2010, then last year finished ninth in the same event at the world track championships. She is also due to ride the individual pursuit on Sunday. Ryan is the daughter of Willie Ryan who represented Ireland in rowing at the 1976 and 1980 Olympic Games. Martyn Irvine and Shannon McCurley are Ireland�s two other representatives in the race. Irvine is seventh out of 24 after two of the Omnium�s six rounds. McCurley�s ride in the women�s scratch race will take place tomorrow. Ryan�s medal comes over a century after Ireland�s last Elite worlds track medals, namely the gold taken by Harry Reynolds in the one mile amateur world championship in Copenhagen on August 15th, 1896, and his bronze the following year. More recently, Irish riders have taken medals of each colour at the Paracycling worlds and also the masters� championships. Sam Bennett also took the European junior points race title in 2008. 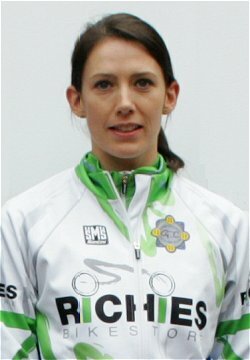 �It is very pleasing, particularly as it wasn�t her main focus,� Cycling Ireland�s Geoff Liffey told Irishcycling.com today. �She will be focusing on the pursuit on Sunday. It was a gutsy performance from her, which reflects the work she has put in since Christmas and the progress she has made. After taking up the sport, her potential became quite clear. Liffey said that she�s gradually been building up the race craft which helped secure today�s result. It�s too late for her to qualify for the London Olympics in the track events, but there is a possibility for her or another Irishwoman to get through to the road contests. Irishcycling.com would like to congratulate Garda/Richies/Ethos CC rider Ryan on today�s superb performance.